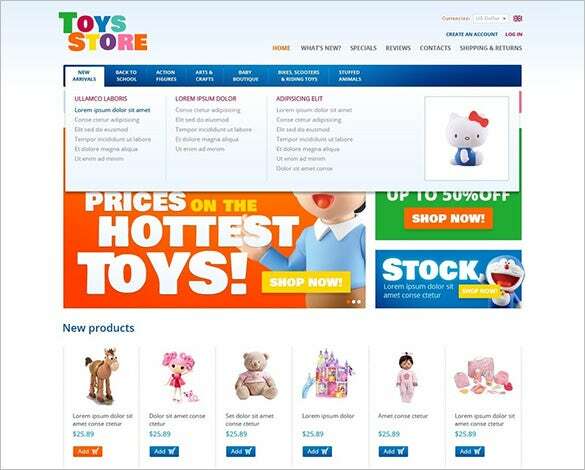 A great way to kick start your online toy store business is using osCommerce toy store templates. With HTML Plus JS animation and 1170 Grid System, these templates will work like a charm in no-time. The premium templates consist of PSD and PHP files for easy download.osCommerce provides you with a variety of features like Admin panel and built in search engine optimization functionality.To kick start your shop take down these Oscommerce templates for free. 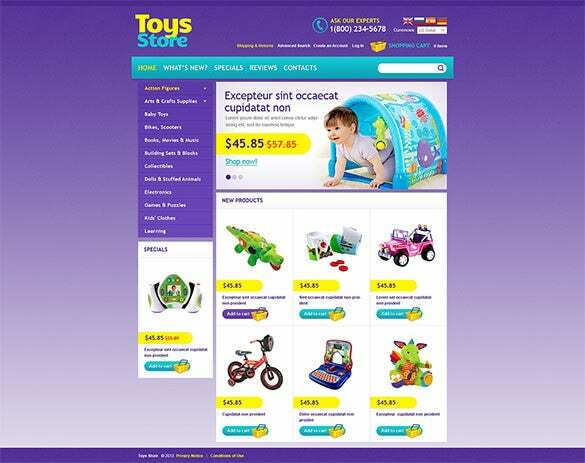 Toy store template is an exclusively developed theme for toy stores. This two column layout theme features admin panel, sections for featured, top sellers, specials, brands options and also allows category wise searches. 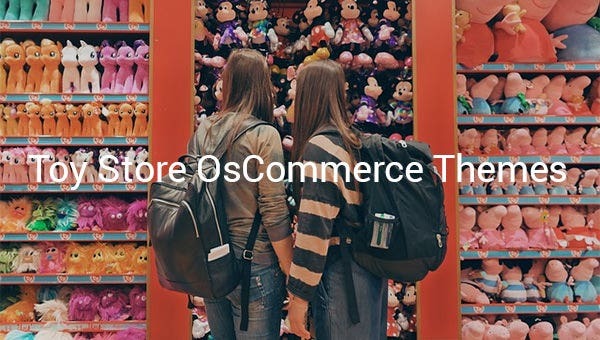 If you are looking for a good toy store osCommerce template, then this is perfect. It has plenty of great features, including compatibility with all browsers, drop down cart, social options and more. Toys for All Ages is a fitting design for your toy store house. The smiling kid images of the theme add the cuteness of the theme along with other features like admin panel, slider gallery, 2 column layout and shopping cart option. 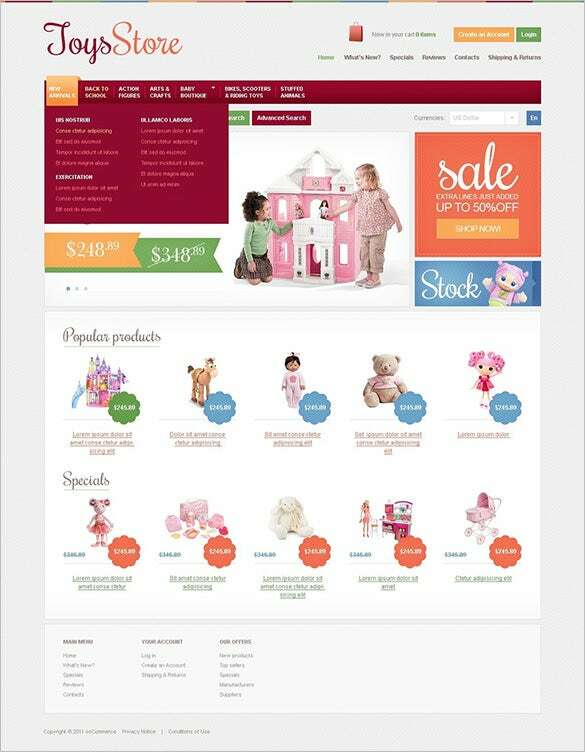 This is an easy to use toy store osCommerce template that is perfect for an online shop or store. 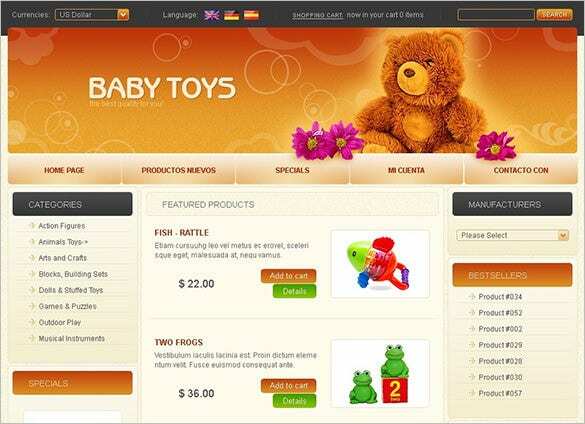 It uses Jquery and it has an easy to use admin panel and a 2 column design that is perfect for any ages. 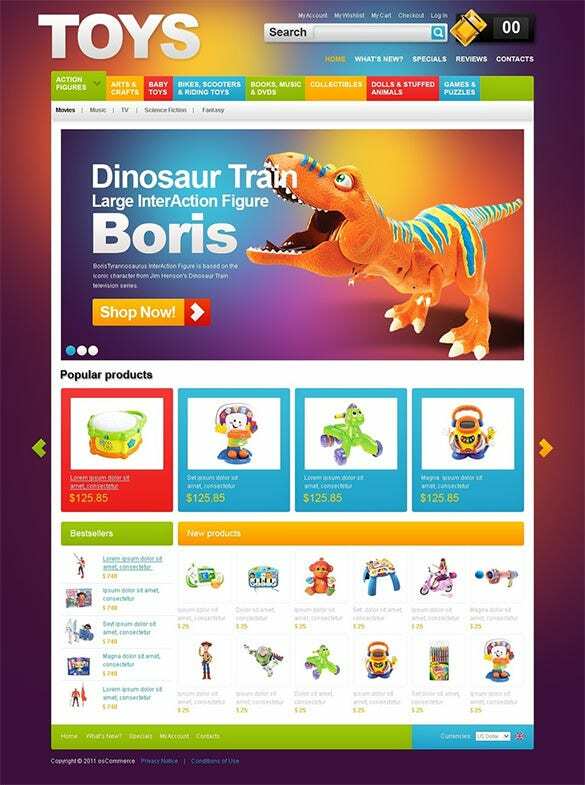 Toy store theme is a theme filled with cartoon images and designs to attract people. It offers sections for special, latest products, and reviews; category wise searching is enabled and also has two column layout and admin panel. This is another simple, yet classic theme that you can use for your online shop. You can have different categories, new products, specials, and much more. You can also easily customize it based on your needs. Elegant designs come with a white background, with beautiful kids images. The theme allows quick and easy navigation, advanced search, banner boxes, shopping carts, admin panel and is wrapped in PSD and PHP sources. Fantastic design comes with a fanciful design for your toy store to grab the attention. Loaded with features like advanced search, easy navigation, the theme also devotes sections for new and popular products and admin panel. You also get guides for different modules, well documented for easy customization. Besides having multiple column layouts, these templates also offer features like sliced PSD, calender, Favicons, and some come with web forms as well. 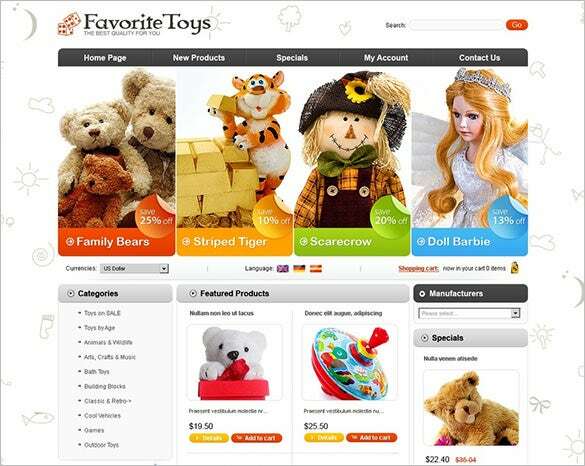 When you think about toys, you automatically think about an online store. 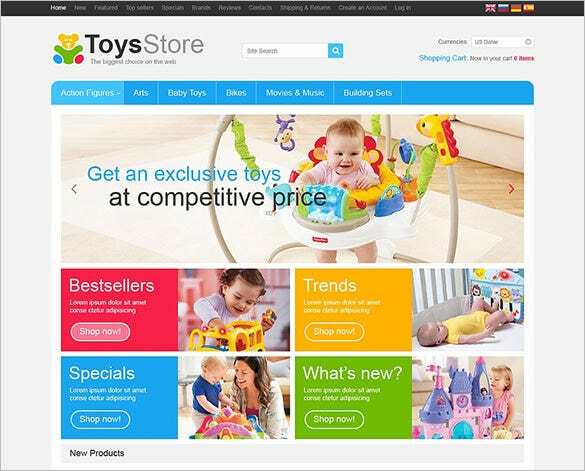 These are some of the best themes that you can use for a store that is toy related.